You probably don’t think too much about your routine cleaning and checkup appointments at the dentist, except maybe that you don’t want to go. Perhaps they crop up at inconvenient times for your work or your children’s school schedule, and you wonder why it is you have to go twice a year – especially if your teeth don’t hurt. Well, your family dentist in Sunnyvale is here to share some reasons why your six-month visits are more important than you think. Unlike your medical doctor who sees you when you’re hurt or sick, dentistry is all about prevention. Your dentist strives to keep your teeth clean and healthy in order to prevent conditions like gum disease and tooth decay from happening in the first place. It’s also your dentist’s job to teach you to do the same with your home care routine. Many dental conditions don’t hurt right away, and by the time you feel any pain, the damage has been done. For example, gum disease, which is the leading cause of tooth loss in American adults typically doesn’t hurt until you’re suffering from the more advanced stage called periodontitis. By this time, your gums are starting to recede and your teeth are beginning to become mobile. Preventive dentistry can save you from many more invasive and costly treatment procedures that you probably could’ve avoided. What Happens During My Routine Cleaning and Checkup? There are a few important things that go on during your six-month cleaning and checkup. First, your dentist will give you a full examination at each checkup to screen for issues like tooth decay, gum disease, and oral cancer. 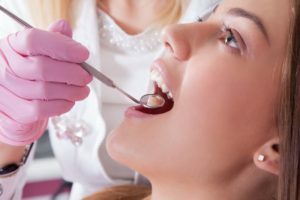 Your dentist can actually detect these concerns much earlier than you can, which gives you the opportunity for treatment with less invasive procedures. For example, if you’re suffering from gingivitis, which is the early stage of gum disease, you may have noticed that your gums were red and irritated, or perhaps they bled when you brushed your teeth. Gingivitis can often be successfully managed, and sometime even reversed with a thorough professional cleaning and improvements to your home care routine. This is much better than the deep cleaning, antibiotic therapy, or surgery that some cases of periodontitis require. By the age of one year old, your child should have their first dental visit. They should continue to see the dentist every six months just like adults do. Your dentist may recommend preventive services such as fluoride treatments or dental sealants to protect their teeth from tooth decay and cavities. No matter what age you are, preventive dentistry is the key to optimum oral health. For over a decade Dr. George T. Philip has been providing patients in Sunnyvale, TX with high quality dentistry in a warm and friendly atmosphere. Dr. Philip welcomes patients of all ages to his practice and he loves building relationships with children. If you’d like to contact Dr. Philip, you can reach us through our website, or at 972-746-2073.